power_fftscope opens the FFT Analysis Tool dialog box to perform Fourier analysis of simulation data signals. The dialog box provides access to all the simulation data signals that are defined in your workspace. This tool can also be activated from the powergui block dialog box by selecting FFT Analysis. FFTDATA = power_fftscope(ScopeData) returns the FFT results for the signal saved in the ScopeData structure. fftdata is a structure with the fields in this table. time The time vector of the simulation data signal saved in the ScopeData variable. signals The signals saved in the ScopeData variable. blockName The name of the Scope block associated to the ScopeData variable. input The input signal of the selected simulation data variable. signal The index of the selected input signal specified by the input field. startTime The start time of the FFT window. cycles The number of cycles of the FFT window. fundamental The fundamental frequency of analyzed signal. maxFrequency The maximum frequency evaluated by the FFT analysis. THDmaxFrequency The maximum frequency for the THD calculation. Set the value to inf to calculate the THD at the Nyquist frequency. FFTdata The analyzed signal (FFT window data). THDbase The base used to compute the THD. Set to fund to normalize the THD with respect to fundamental value. Set the THDbase to DC to normalize the THD with respect to the DC component value. freqAxis The type of frequency axis, in hertz or harmonic orders, of the FFT analysis plot. mag The computed magnitude of FFT. phase The computed phase of FFT. THD The computed total harmonic distortion for the analyzed signal. The THD calculation includes all the inter-harmonics of the selected input signal. samplingTime Return the sampling time of the selected input signal. samplePerCycle Return the number of samples per cycle of the selected input signal. DCcomponent Return the DC component value of the selected input signal. magFundamental Return the fundamental component value of the selected input signal. FFTDATA = power_fftscope(FFTDATA) uses the FFTDATA structure as a template variable to modify analysis settings and signal selection, and to perform FFT analysis. The power_fftscope function ignores any user-defined FFTDATA structure that is not listed in the above table. power_fftscope(ScopeData) plots the FFT analysis results for the last simulation cycle of the signal saved in the ScopeData variable. power_fftscope(FFTDATA) plots the FFT analysis results for the signal options specified in the FFTDATA structure. Refreshes the list of simulation data variables in the Available signals list. Refreshing allows you to import additional simulations signals without the need to close and reopen the tool. Lists the simulation data variables that are present in your workspace. These structures are generated by the Scope or To Workspace blocks in your model. You can refresh the list of available signals by clicking the Refresh button. Use the drop-down list to select the variable that you want to analyze. Selects the input signal of the selected simulation data variables specified in the Structure field. Variables that have multiple inputs can be generated by a Scope block that has multiple input ports. Indicates the index of the selected input signal specified by the Input parameter. 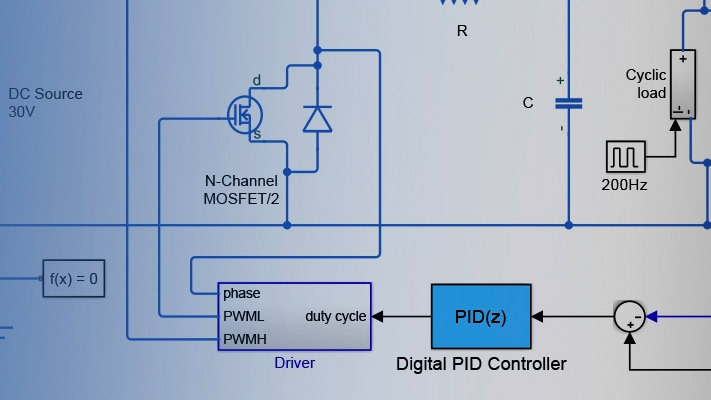 For example, the Signal number parameter allows you to select the phase A signal of a three-phase signal connected to input 2 of a Scope block. Displays in the upper plot the signal selected by the Name, Input, and Signal number parameters. Displays in the upper plot the portion of the selected signal where the FFT analysis is performed. Specifies the start times for the FFT analysis. The FFT analysis is performed on the portion of the signal starting at the specified time and for the specified number of cycles. Specifies the number of cycles of the selected signal to analyze for the FFT analysis. Specifies the fundamental frequency, in Hz, as a reference frequency for the FFT analysis. Specifies the maximum frequency, in Hz, for the FFT analysis. Select the Nyquist frequency to compute the THD to the maximum frequency equal to the Nyquist frequency. The Nyquist frequency is half the sampling frequency of the selected signal. Select the Same to compute the THD to the maximum frequency equal to the frequency specified in the Max frequency parameter. The THD calculation includes all the interharmonics of the selected input signal. Select Bar(relative to fundamental) to display the spectrum as a bar graph relative to the fundamental frequency. Select Bar(relative to specified base) to display the spectrum as a bar graph relative to the base defined by the Base value parameter. Select Bar(relative to DC component) to display the spectrum as a bar graph relative to the DC component of the signal. Select List(relative to fundamental) to display the spectrum as a list in % relative to the fundamental or DC component. Select List(relative to specified base) to display the spectrum as a list in % relative to the base value defined by the Base value parameter. Select List(relative to DC component) to display the spectrum as a list relative to the DC component of the signal. Enter a base value for the display of harmonics. Select Hertz to display the spectrum frequency axis in hertz. Select Harmonic order to display the spectrum frequency axis in harmonic order relative to the fundamental frequency. Displays in the lower plot the FFT analysis results for the selected simulation data signal. Click to export the FFT analysis result in a separate plot window. Closes the FFT Analysis Tool window.